Irina is an Associate Professor and a Research Fellow at ISST Labs, ITMO University, St.Petersburg. She is also a co-founder of ODI St.Petersburg and Chief Coordinator of Open Knowledge Russia. Her main professional interests are focusing on Open Data, Open Science, Data Science, intelligent systems development and all around it. In 2013 she and Anna Sakoyan initiated a joint project on Data Driven Journalism in Russian. 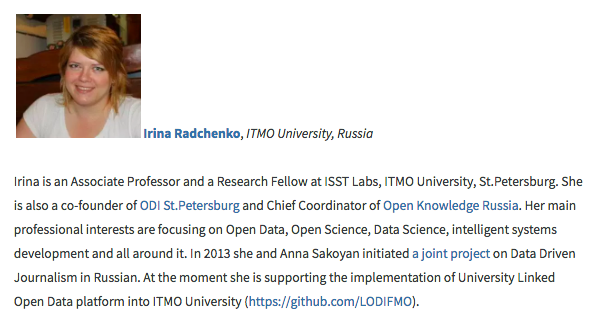 At the moment she is supporting the implementation of University Linked Open Data platform into ITMO University (https://github.com/LODIFMO). В декабре 2016 года Ирина Радченко стала Представителем THOR (Technical and Human Infrastructure for Open Research). Здесь можно ознакомиться с презентацией о проекте THOR на русском языке: https://www.slideshare.net/iradche/thor-74977088. Выступление было организовано на базе ММСО-2017.